House of Fraser and Sports Direct: What happens next? August 15, 2018, 8:47 a.m. The biggest story of the last few days in the retail world was undoubtedly Sports Direct’s acquisition of the struggling House of Fraser, for a reported £90million. Sports Direct’s founder Mike Ashley has vowed to keep open the majority of the 59 stores he has bought, and has spoken about how he plans to turn the chain into the ‘Harrods of the high-street’. I have explored the differing fortunes of both brands a number of times in this column. 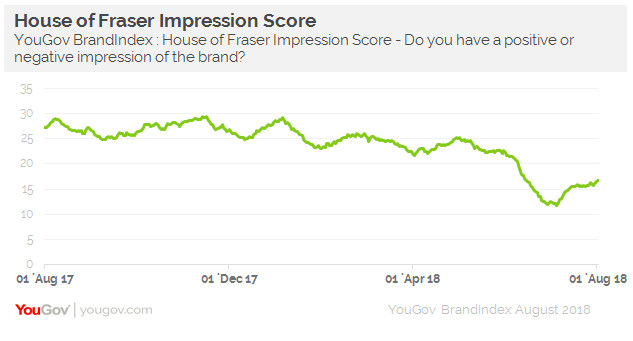 Looking at House of Fraser first of all, YouGov BrandIndex data indicates that consumer perception of the brand has dropped significantly over the past year, in line with its financial problems. Around this time last year, the retailer’s Impression score (do you have a positive or negative impression of the brand) was around the +27 mark. However, by early July 2018, this score had decreased to +12. Conversely, Sports Direct was the most improved brand in YouGov’s annual global health rankings. However, this may have more to do with the fact that it has managed to avoid the negative headlines that it experienced in 2017. Indeed, while its Index score improved by 6 points, it is still in negative territory (its rating moved from -12 to -6). The difference between the brands is fairly simple, while House of Fraser has been outflanked by nimbler online rivals and failed to establish a clear identity, consumers know what Sports Direct represents. In the case of the sports retailer, people tend to be willing to disregard any objections they may have about the brand’s ethics, due to the cheap prices on offer. 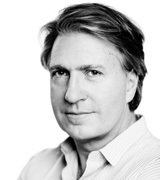 Observers are now awaiting concrete news on Ashley’s reinvention plans for the company. Plans to take House of Fraser upmarket may appear incongruous with the model Sports Direct has established over the years, so implementing this will need a lot of brand positioning work. This is assuming of course, that Ashley decides against simply converting House of Fraser stores into Sports Direct shops. Naturally, making House of Fraser’s online offering competitive with greater investment in technology will also be a pre-requisite of any relaunch.